That’s me in the UFO in November, 2008. Photo by my wife, Leona Illig, for MacLife magazine. The Alnitak region of the constellation Orion, photographed by me for MacLife on December 2, 2008. One asterisk * means I have or had a license and I have tried the application. application. Three asterisks *** means that I am a frequent user. because—except on rare occasions—I am not a Solar System Photographer. about new software and send me updates with your own brief writeup for inclusion on this page. AstroPlanner * Observation planning and telescope control. Highly recommended. Can communicate with Equinox. Cartes Du Ciel/Skychart ** Originally Windows-only and known as Cartes Du Ciel (Sky Charts), this venerable (and free) program has come to OS X. Don’t forget to download the databases under Current Catalogs. ccdPlace For imaging with ALTA CCD cameras. The current version is used mainly by professionals, and it is free. Future versions will reportedly support CCD, CMOS, and DSLR cameras from a variety of vendors, and will not be free. There is no web site for this software at this time. E-mail Georg Tuparev at gtupar@tuparev.com to get a copy. FITS Liberator *** From ESA/ESO/NASA. As far as I know this is the only way to bring a FITS image into Photoshop for further editing without saving the FITS as another format first. I use this Photoshop plug-in frequently and find it to be extremely convenient. Version 2.3, released in November, 2009, works with Photoshop CS3 and CS4. Be sure to read the installation instructions carefully, especially if you are installing in Photoshop CS3. iAstroPhoto * Focusing assistance for Canon digital SLR’s. The author was inspired by DSLR Focus for Windows. Not all Canon cameras are supported. Author Steve Bryson is apparently too busy with his day job to continue development. iOS Devices The iPhone is a Mac (sort of)! Daniel V. Schroeder, who teaches astronomy and physics at Weber State University in Ogden, Utah, has assembled a list of star-charting apps for iPhone and iPod Touch. Keith’s AstroImager Webcam control and autoguiding (for Meade LX200-compatible telescopes). Free. Keith’s Image Stacker * Recently updated for Intel Macs and Leopard. Stacking and combining of still images or QuickTime videos. $15 and worth every penny! Lunar Discoverer * A comprehensive Moon atlas. As of this writing, in late June, 2009, I have only recently purchased this software and I do not have extensive experience with it yet. Lynkeos * Stacking and combining of still images or QuickTime videos. Free. 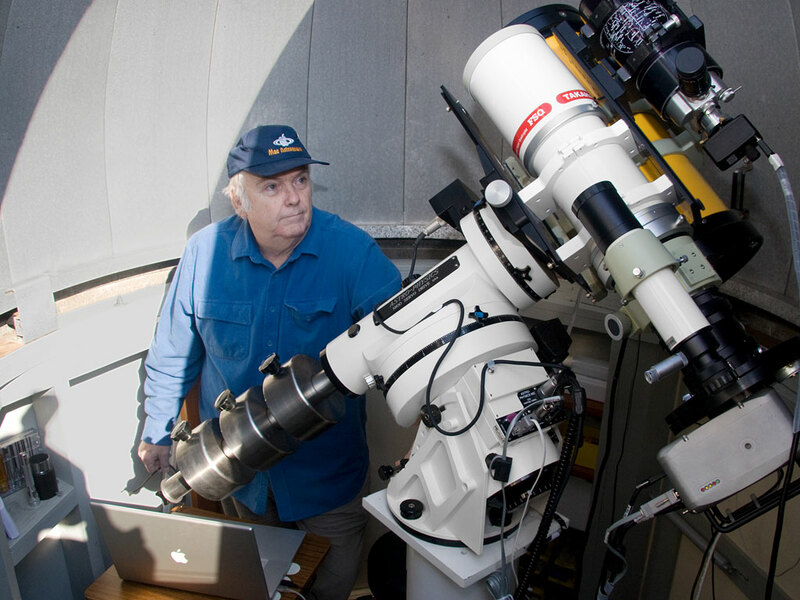 The MacDob Project Works with third-party servo hardware to control a Dobsonian telescope (“Dob”). Can even control a Dob via a bluetooth-enabled cell phone! Mars24 * Java-based sunclock for Mars, showing graphical representations of the planet’s position relative to Earth. Also available: Titan24. Free from NASA. MoonMenu *** August, 2008: Finally, an update! Displays information on current, past, and future lunar phases. Observing Logs Various observing logs in database format. Free. PHD Guiding *** This is another great piece of software from Craig Stark, who says “PHD Guiding is designed to be ‘Push Here Dummy’ simple, yet provide powerful, intelligent auto-guiding of your telescope for both PCs and Macs. Connect your mount, your camera, select a star, and start guiding. That's it! ...In PHD Guiding, all calibration is taken care of automatically. You do not need to tell it anything about the orientation of your camera, nor do you need to tell it anything about the image scale. The automatic calibration routine takes care of this for you. Odds are you won't ever need to set a single parameter. Just select your star and hit "PHD Guide" and let the software take care of it.” This is the software I use most often for guiding with my Starfish guide camera. Guiding could hardly be simpler than it is with this combination. Pixinsight ** Pixinsight is astro-image processing software that came to the Mac in December, 2008. It is world-class software—as advanced as any astro-image processing application available to date. The interface is not very Mac-like, and the learning curve is made a bit steeper by the lack of documentation, but Pixinsight touts their forums as the source for help. Dr. Craig Stark, himself an author of excellent Mac imaging software (see Nebulosity and PHD Guider) has put a couple of Pixinsight video tutorials at http://www.stark-labs.com/blog/files/PITutorials.php. Also see Craig's blog at http://www.stark-labs.com/blog/blog.php. SkySafari Pro *** Planetarium software with telescope control. Runs on OS X and iOS. An iOS device (iPhone, iPad, iPod Touch) can control a telescope via WiFi using SkySafari and Southern Stars’ SkyFi Wireless Telescope Controller. A guaranteed winner for your home use or at a public star party. Stargazer’s Delight Planetarium program; runs natively under OS X and OS 8.1 and above. Starlink *** I hesitated before listing Starlink here because it is part of the Fishcamp Engineering’s Starfish Guide Camera package. I bought a Starlfish in November, 2008, however, and I found the Starfish and Starlink combination provided excellent guiding. This software has been rendered largely obsolete by PHD Guiding. StarMap Pro for iOS This was the first iOS app I listed here. StarMap Pro (there is a regular edition as well) is available from the iTunes store. It deserved special mention because, as far as I know, it was the first iOS app that could control a telescope, albeit indirectly. Starmap Pro can synchronize with Equinox Pro (see above) and control a telescope that is connected to the Mac that is running Equinox Pro. Starry Night Pro ** Planetarium and telescope control. Very elaborate very good. 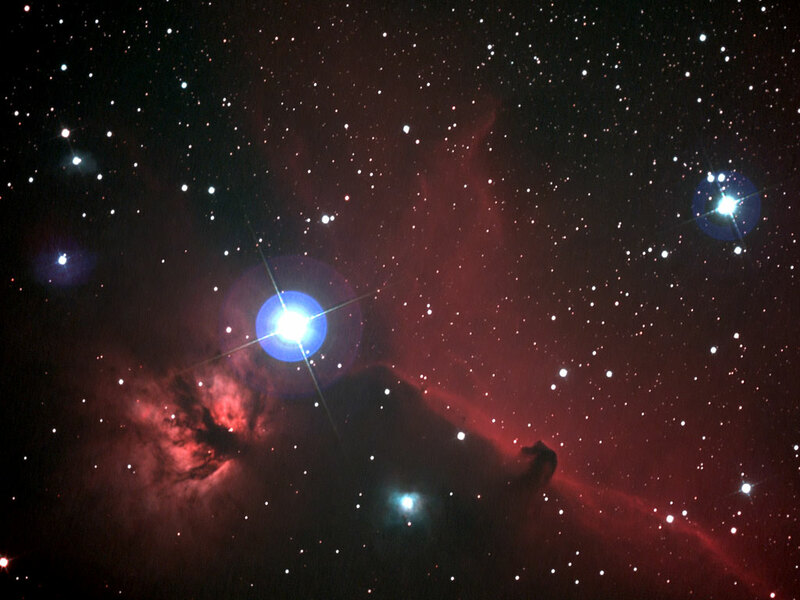 Stellarium * Free planetarium program, noted for its beauty. Not for heavy-duty observing, I think, but good for finding out what’s up. TheSkyX Professional *** This is part of the complete re-write of all of Software Bisque’s software. TheSkyX Pro is the replacement for TheSky 6 (Windows only) and it offers as add-ons both camera control (replacing CCDSoft) and TPoint. This is the first time that TPoint has been available for the Mac. TheSkyX is suitable for the most demanding user. Software Bisque is justifiably famous for superb customer support through the forums at Bisque.com. In addition, in my experience Software Bisque ranks very high in quality control; problems are rare and if they turn out to be bugs, they are addressed quickly. Please Read This Disclaimer. TheSky HD For iOS A powerful cousin of TheSkyX Pro running on iPad or iPhone! Trust me on this--it is awesome on an iPad! Voyager A planetarium and telescope-control application. At least two Mac astronomers report that Voyager is worth a look, and one of them says that Voyager has been his astronomy app of choice for the Mac since it first appeared in the pre-OS X era. Where is M13? * Planetarium software and printed charts and books will tell you a great deal about deep-sky objects, but they don’t show you where an object is in the Milky Way relative to the Earth (or outside the Milky Way, as is the case with other galaxies.) That’s where Where is M13? comes in. It helps you visualize the 3-D locations in addition to the physical properties of common deep sky objects. A nice feature is that you can choose relative or absolute data about an object. Where is M13? formerly cost $19, but author Bill Tschumy has made it freeware. Where is M13? is available for Mac OS (Universal Binary), Linux/Unix, and Windows. XEphem ** UNIX planetarium and telescope control. Runs under Apple’s X11 environment. Free if you want to compile it yourself, available as a Mac OS X package installer for a modest fee. This is an extremely powerful application that is worth the time required to learn to use its various options and functions. It is a good introduction to running UNIX software on a Mac. Please e-mail me if you would like to comment on, contribute to, or correct this list. There is a great deal of UNIX software available from the major observatories and research institutions around the world. Macs can run all of it because the Mac OS is UNIX. In some cases, like IRAF and XEphem, there are Mac installers available that work from the standard Mac graphic user interface. In other cases it is assumed that you know UNIX and you are expected to compile and install the software from the UNIX command line. In the case of IRAF and some others you must know some programming in order to write little programs called “scripts” that are needed to control the software. I have omitted most of that software from this page, but a Google search something like this should show you a selection. Not featured here is Windows software because this is a Mac astronomy page. You may safely conclude that I'm not a Windows fan, but I would not spite myself or limit my options by ignoring good Windows software if I needed it to do what I want to do. I sometimes boot my old 17" MacBook Pros in Windows 7 Pro or run Windows under Parallels Desktop. I have several excellent Windows applications from Software Bisque (though I am now using their Mac software), plus AstroArt, CCDStack, MaximDL, and other Windows astronomy applications. I want to emphasize that I get along with Windows OK, but as of this update on April 26, 2018, I have not found the need to run Windows in astronomy for more than a six years. I boot Windows periodically to get my anti-virus software updates and Microsoft updates and that's about the extent of it. The majority of the astrophotographs displayed on primordial-light.com, and all recent ones, are 100% Mac-made, but not all of them. If you are going to control a telescope with a computer, you might need a Keyspan Serial-to-USB Adapter. This is because some mount manufacturers are in the serial-port age—years after Apple abandoned serial ports, followed (as usual) by makers of Windows-only PC's. My two RoboFocus units use serial ports. The adapters I have used with a Mac are the USA-19HS “USB High-Speed Serial Adapter;” the UPR-112G Mini Port Replicator; and the USA-49WG “USB 4-Port Serial Adapter.” The latter is what I use now because I have more than one serial device—two RoboFocusers. Keyspan is not the only manufacturer of serial adapters, but I know that the models that I named above work with Mac OS X and with Windows. I have, on one occasion, quite a few years ago, accepted free software as a gift from Software Bisque. The gift was unsolicited and it came without conditions or suggestions as to what I ought say or write about the application—if I chose to mention it at all. Furthermore, before I accepted the one piece of free software I already owned a number of Software Bisque applications that I purchased at their full retail prices. As of late April, 2018, I have, for a number of years, used only Software Bisque products that I purchased at full retail price. I do not believe that my objectivity in expressing my opinions about Software Bisque applications has been compromised. My bias is toward products that work for me, be they freeware, gifts, or costly suites. Software Bisque products for Mac OS and Windows have always worked well for me, but in all cases I make no representation that what works for me will work for you. You should, as always, judge for yourself, and many software packages have trial versions to allow you to do that. This photo was not posed. 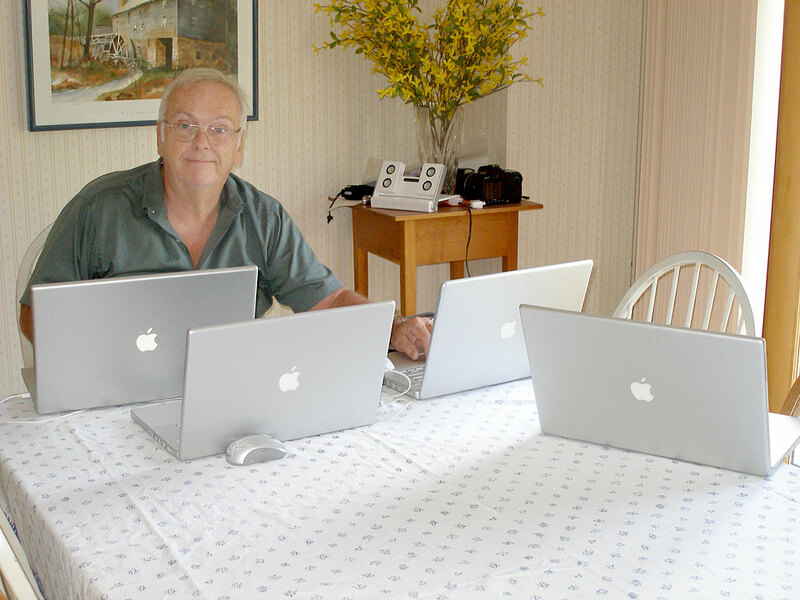 I was updating software on my 17" and 15" MacBook Pro's, my sister-in-law's 15" MacBook Pro, and my niece's 17" PowerBook when my wife, Leona, said "Look here!"